Supertone was a record label made for Sears. It was marketed as a higher-quality label and replaced the Silvertone. Supertone was introduced in 1924 and discontinued in the same year. 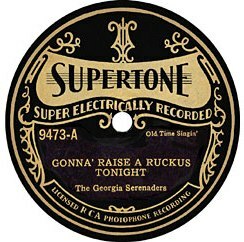 The 1924 series of Supertones were made by the Fletcher Record Company and are the rarer of the two label designs. Supertone would re-emerge in mid-1928 and last until 1931. From 1928-1931 over 800 records were issued. The 1928-1931 labels were black with the words “Super Electrically Recorded” in block letters below the shield. This meant that the recording artist used a microphone to record the sound rather than play into a horn. About halfway through the series the reference to Sears, Roebuck and Co was replaced by the words “Licensed RCA Photophone Recording”. These Supertone labels were pressed by Starr Piano Company until 1931. Many of the Starr produced recordings were done under artist pseudonyms. In the final year of the Supertone Record label, Sears switched record manufacturers from Starr to Brunswick Radio Corporation. These new Supertones had an S-prefix before the record number. Like the early Fletcher made Supertone records, these Brunswick Supertones are rare too. Supertone Records were discontinued in 1931 by the Great Depression and the desire for Sears to bring back the Silvertone Label. Music Genres: Band, Waltz, Orchestra, band, jazz, blues, Midwestern dance. The artist on this label, below, are the Miami Syncopators – You can take me away from Dixie (but you can’t take Dixie from me) 1502-A. The Miami Syncopators were a pseudonym for Harry Reser and his Orchestra. Supertone Record Label: 1924. This label design lasted only one year. A white, gold, and black design. Note the Sears phrase at the bottom. The artist below is Gene Autry (as known as the Singing Cowboy) In the Shadow of the Pine 9704-B. Supertone Record Label 1928-1931. Produced by Starr Piano Company. Note the” Licensed RCA Photophone Recording” phrase at the bottom. A gold and black design. The final Supertone Label is an artist called Buell Kazee, A Mountain Boy Makes his First Record-Part 1 S-2084. Supertone Record Label by Brunswick Radio Corporation. Produced in mid-1931. Note the “S” prefix and the Brunswick Radio Corp phrase at the bottom.